In an earlier blog-post, I explored the question of "Celtic" identity through a review of an exhibition at the British Museum, and a related BBC television series. The British Museum's current major exhibition is on the Scythians, an even more elusive people: it is subtitled "Warriors of Ancient Siberia," but the Scythians (as the exhibition itself makes clear) were so much more than this. Certainly they were warriors, and, as such, perfected the art of mounted warfare, and the technology of the complex bow, to a greater extent than any people before them, and in ways that would influence the military history of Europe and Asia for centuries after their time. They were also herders, goldsmiths, and traders, and their domain extended from Siberia in the east to the Black Sea in the west. 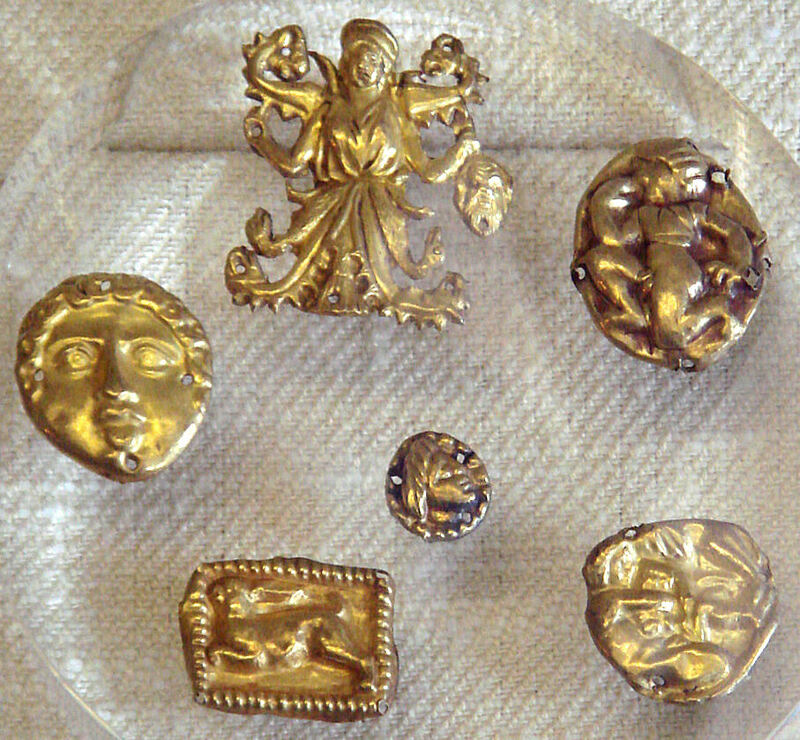 Gold plaque depicting Scythian archers, which would probably have been sewn onto a garment, probably from Kul-Oba (Crimea). Photo: World Imagery (licensed under GNU). 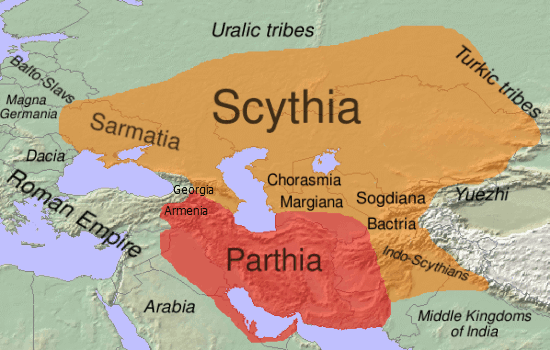 The Scythians are the earliest in a succession of historically documented peoples whose natural environment was the steppe belt that connects Europe and Asia (later examples included the Huns, Goths, Turks, and Mongols). 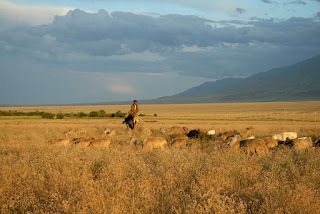 These vast, grassy plains were unsuitable for ancient agriculture, and thus could not support settled, urban communities, but were ideally suited to a nomadic lifestyle, with the herding of horses, cattle, sheep and goats. The settled communities of the Greek, Persian, and Chinese worlds feared the sometimes violent incursions of their nomadic neighbours, yet they also depended on them for access to goods that they valued. 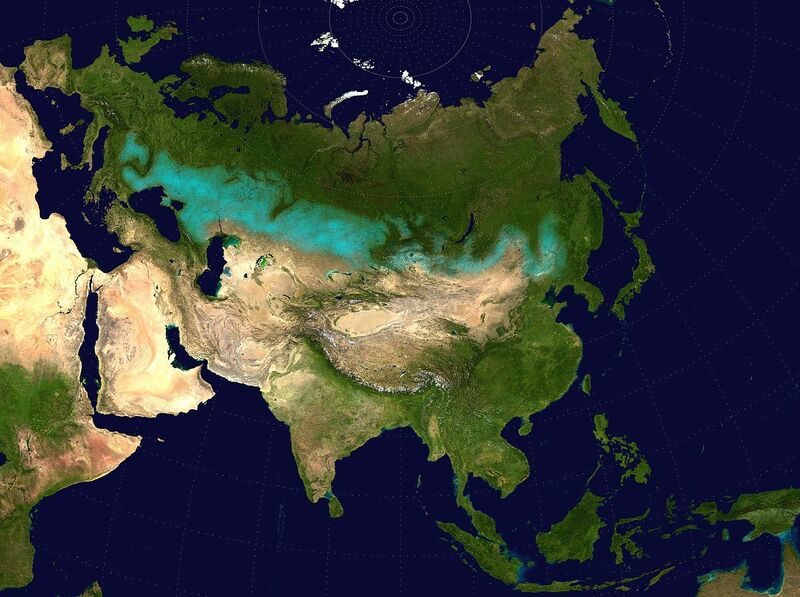 The Eurasian steppe belt, indicated in blue. Image: Clivius (Public Domain). Scythia and Parthia (Persia) in c 100 BC. Image: Dbachmann (licensed under GNU). 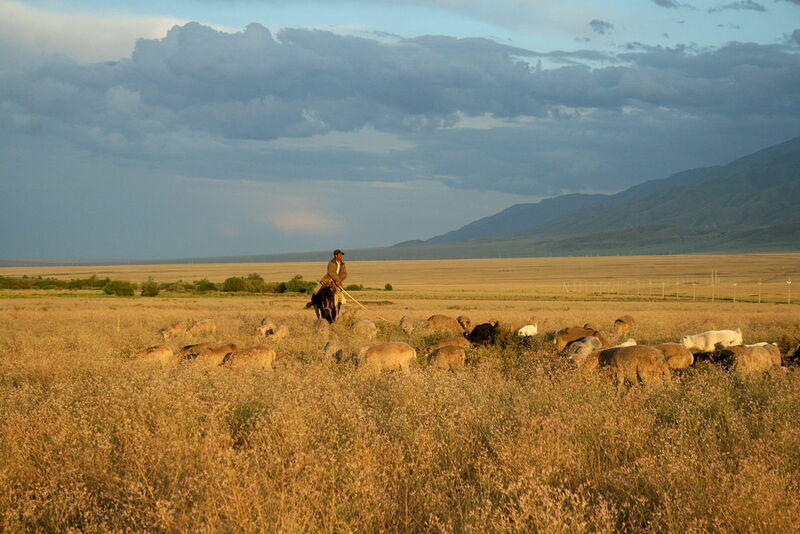 The steppes of Kazakhstan. Photo: Togzhan Ibrayeva (licensed under CCA). The Greek historian, Herodotus, seems either to have met Scythians, or to have met people who had traded with them, but he would have known nothing of Siberia. 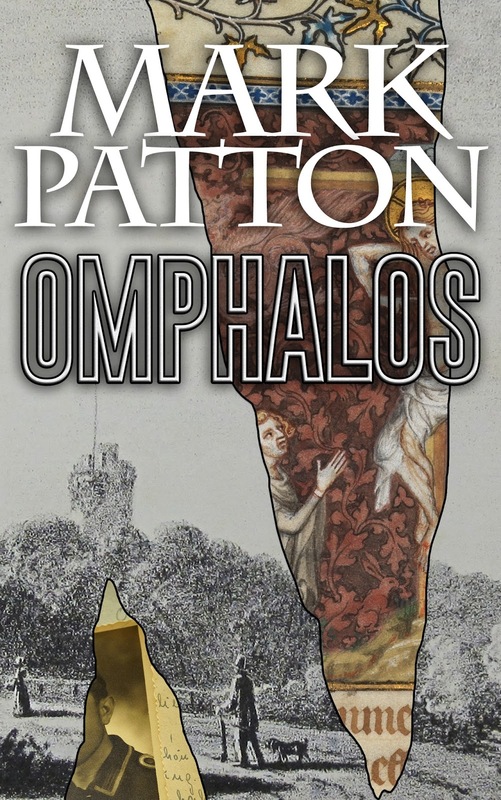 His Scythians lived along the northern shores of the Black Sea, including the Crimea: he refers to more or less settled communities of "Royal Scyths," who regarded the truly nomadic Scythians to the east as their slaves. Archaeological evidence suggests that these "Royal Scyths" had a taste for Greek wine and metalwork, which they probably obtained in exchange for Chinese silks and Indian spices. Electrum vessel from Kul-Oba (Crimea), found between the feet of a woman in a Scythian royal grave, 400-350 BC; Hermitage, Saint Petersburg. Photo: Joanbanjo (licensed under CCA). The design from the Kul-Oba vessel; the man on the right is stringing his bow, whilst the one on the left wears a diadem, similar to that worn by the principal (male) burial in the grave; all wear trousers, a characteristically Scythian garment (image is in the Public Domain). 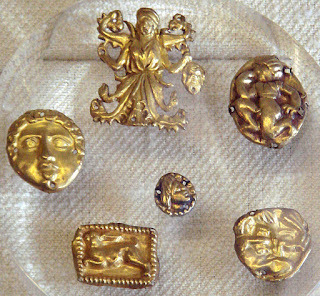 Gold ornaments from the Kul-Oba grave, showing Greek influence; these would probably have been sewn onto clothing; Cabinet des Medailles, Paris. Photo: PHGCOM (licensed under GNU). Relief from Behistan (Iran), showing the Scythian King, Skunkha, as a captive of the Persian King, Darius the Great. 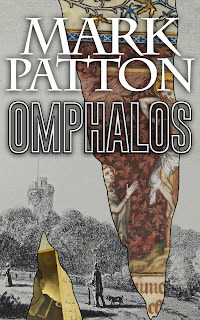 Photo: Livius.org (reproduced with permission). At the other end of the trade route, in the Altai Mountains of southern Siberia, close to the modern borders of Russia, China, and Kazakhstan, lived other groups of more or less settled Scythians, whose elites lived a similarly "royal" lifestyle, based on their close trading contacts with the Chinese. The archaeological evidence from Siberia, which is well represented in the British Museum exhibition (many of the artefacts on loan from The Hermitage Museum in Saint Petersburg), is of particular interest, since frozen conditions have allowed for the exceptional preservation of wooden objects, textiles, and even human bodies, some of which have elaborate tattoos. 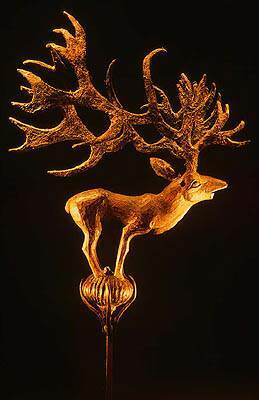 Gilded wooden deer from a royal grave at Pazyryk, Siberia, c 400 BC. Photo: The Hermitage Museum (reproduced under Fair Usage Protocols). 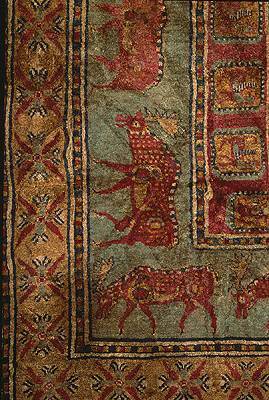 Part of a carpet from the Pazyryk burial chamber; possibly made in Persia or Armenia, it is the oldest surviving wool-pile carpet in the World. Photo: The Hermitage Museum (image is in the Public Domain). Painting on a felt hanging from the Pazyryk burial chamber. Photo: The Hermitage Museum (image is in the Public Domain). Gold plaque from Siberia, thought to represent a resurrection scene from Scythian mythology. Photo: The Hermitage Museum (reproduced under Fair Usage Protocols). The Scythians were never a united people, and may not even have shared a common language. Those around the Black Sea seem to have spoken a language allied to modern Iranian, whilst others may have spoken Germanic, Turkic, or Mongolic languages. As highly mobile traders, however, their elites are likely to have been multi-lingual, and they seem to have initiated the complex network of overland trade-routes that would later be referred to as the "Silk Roads," connecting Europe and the Middle East with India, Central Asia, and China, and which continued to operate, in a myriad of different forms, throughout ancient and medieval times, until they were finally supplanted, in the late Fifteenth Century, by maritime trade routes controlled by the Portuguese and Spaniards. The British Museum exhibition, which runs until 14th January, includes a wealth of spectacular objects, never previously seen in western Europe, and shedding important new light on our shared European and Asian heritage. Excellent article, Mark. I've been fascinated by the Scythians for decades. I'm sorry not to be able to get to the British Museum now, as I live in the US now. Thanks for at least being able to get a taster here. A truly fascinating post. Thank you. I was in London at the end of August for the bank holiday weekend (terrible timing, I must say!). I did get to the British Museum and I loved every bit of what I saw, but of course I didn't see everything. I don't know if this exhibit was there at the time; if it was, I missed it. So thanks for the photos.